Mermaid Melissa is not like most Floridian girls. For one, the 33-year-old formerly known as Melissa Dawn can hold her breath for five minutes underwater. For another, she has a whole wardrobe of glittery fish tails. The mermaid has more than 480,000 followers on Facebook, and a YouTube channel which she uses to broadcast videos of herself swimming through clear seas to her 100,000+ subscribers. Why? Because when mankind has messed up the seas, one of us has to take to the waves. Melissa works with charities, including Florida Fish, as a mascot raising awareness about the decline of aquatic life and coral reefs, and the damage we are doing to our seas. Her most recent project took place in Australia, at the Great Barrier Reef, which Greenpeace argues our actions are destroying. As it's World Ocean Day today, we've decided to talk to her. How are you celebrating World Ocean Day? 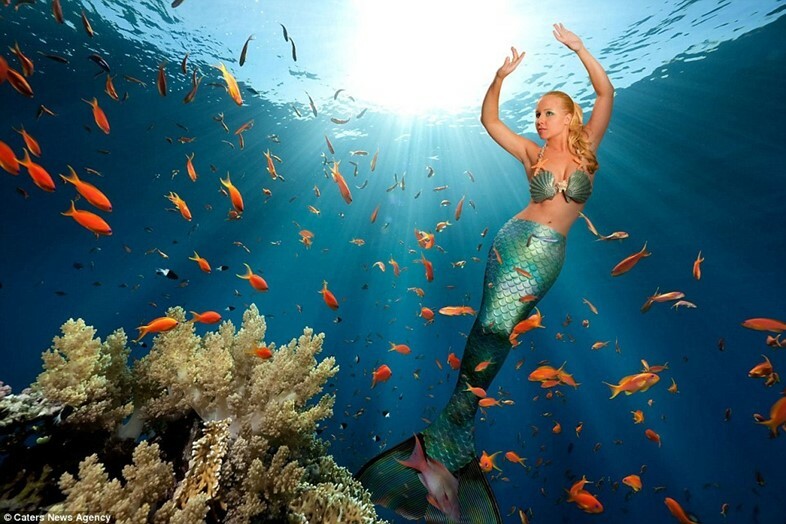 Mermaid Melissa: I am attending a private event during the day and have a mermaid sighting ocean appearance to celebrate World Ocean Day at sunset. Why are you a mermaid? Mermaid Melissa: I became a mermaid to bridge the gap between being human but having a deep connection with the ocean. I wanted to be a voice for the voiceless and speak up for marine mammals. By being a real-life mermaid performer I can raise (awwreness of) ocean conservation through underwater entertainment. Do you like the film The Little Mermaid? Mermaid Melissa: I have found a lot of inspiration from The Little Mermaid, even performing in a green replica tail as Ariel and making a tribute video of me lip-syncing underwater to the 'Part Of Your World' song on YouTube. Splash – the 1984 classic movie with Daryl Hannah – is more of a real-life mermaid movie inspiration. It inspired two other tail replicas I have with the orange colour to match. I can relate to her mermaid character a lot because I also feel more comfortable in the ocean than on land. When did you start raising awareness about the ocean? Mermaid Melissa: I have been very aware of the pollution we as humans have been making since I was a young girl. While walking the beach, I have early memories of trash, fishing lines, empty bottles and plastic washed ashore. I even remember thinking how sad it was when it was being used for birds' nests or tangled on a dead sea creature found on the beach. To this day, I have yet to go to the beach and not find trash I have to pick up. I'm making people aware that it is a current issue worth addressing now instead of leaving the mess swept under the the rug for future generations to clean up our mess, which is very selfish of us. We should take pride in our planet and take action to make a difference now. Where are the greatest threats for the oceans today? Mermaid Melissa: I feel that overfishing, the type of fishing methods we use – such as bottom trawling – are the most destructive (threats posed) to our oceans causing ocean acidification. This is killing our coral, which in turn kills the fish that live in the corals, and the domino effect goes down the line eventually affecting us all. We need to have more ocean sanctuaries and areas that are off-limits to any commercial fishing or drilling. 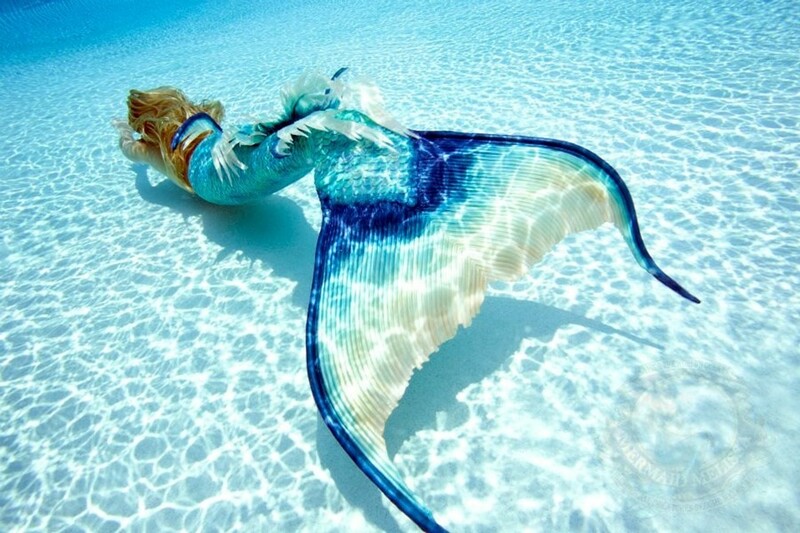 What's the best part of being a mermaid? Mermaid Melissa: I like that I can use the mermaid image as a mascot to put a positive spin on helping to save our oceans. Live shows and appearances also allow me to demonstrate how hard I have worked to make it look as realistic as possible. Talking with people after events or interacting with children at pool parties is always really fun for me as well. What's your favourite sea animal? Mermaid Melissa: Growing up, I loved Atlantic bottle-nosed dolphins. I used to swim with a pod of them when I was a kid since my hometown was right by the ocean. It made me want to better understand their world and become like them, or at least understand what it is that they are thinking. It's clear to me that marine mammals such as whales and dolphins are highly intelligent, more that many people realise. Much like elephants, they can learn and remember highly complex skills. Do you wear your tail every day? How many do you have? Mermaid Melissa: Right now I have 16. Over my years performing I have tried 25 different types. I collect mermaid tails much like a woman would collect shoes, jewellery or clothes. Do people respond well to the way you raise awareness? Mermaid Melissa: Yes, I do not preach or throw 'doom and gloom' in their faces. I talk about the power we all have to turn things around and how it can be empowering to know you are actively helping to make changes for the better in helping our oceans and saving our planet. How can we help the oceans? Mermaid Melissa: Acknowledge that we all need to do our part by speaking out about ocean preservation and posting about it on our social media platforms. Find local programs you can get involved with, post your positive ideas online to your friends and family, find online communities that also promote marine conservation that you can interact with, and let it be known that you support these causes. I am a strong believer that if people see that it matters to you, they will also be inspired to make it matter to them. How we vote, what causes we support, and the petitions we share, are all small efforts that make big changes for the better. Are you a member of any activist or advocate groups? Mermaid Melissa: I actively support the efforts being made by the members of #BLACKFISH which you can learn more about by visiting The Dodo website. You can also look into the efforts being made daily by following #EmptyTheTanks, #TheCove and #SeaShepherd. Is dressing up and having fun as well as advocating for a cause an effective way for anyone to raise awareness? Mermaid Melissa: I think the best and most overlooked way people are missing chances to get involved without dressing up is to post weekly positive images, or posts that keep the issues in everyone's thoughts. It is easy to forget how much is going on around us outside of our own daily routines, so by posting, tweeting, and talking about the issues we face, you can force our society to continue to address ocean conservation. Finding your voice within your own inner circle at work or with friends, and utilising the resources you have can have a profound impact for the better.